I created a post in Weblogs in 2009 on how to use the ActiveX DateTime Picker (MSComCtl2.DTPicker.2) on a grid where in addition to the instructions, I shared a sample form to show how it can be done. But that sample form was now lost in Weblogs and while the instructions there are clear, I failed to include some more steps on the further adjustments I did the day after said blog was posted. And so when a foxite forum member sought assistance in "taming" that elusive ActiveX DTPicker inside the grid and I pointed to my Weblogs article on that, there are missing steps. Worse, I myself forgot exactly how I have done that last time because I forgot to save a copy of the sample form I shared before. Not to mention I actually do not use that activex DTPicker and only has done that blog last time out of curiosity. Anyway, since I became curious again on how I did that last time plus maybe some may need it again, I experimented again on that problem and got it working again, LOL. So I am recreating the steps needed to make it work in a grid in this blog. * Now, on the column where we placed that activex object, there will be two controls, i.e., Text1 (default) and OleControl1 (activex dtpicker). Leave the CurrentControl to the textbox (text1) because without it, you won't see the dates. This activex DTPicker has a very nasty habit of blanking the entire column so it can show itself on the active cell. So we need Text1 to show the dates on inactive cells and the DTPicker on active cell. * Set that column's Sparse property to .F. 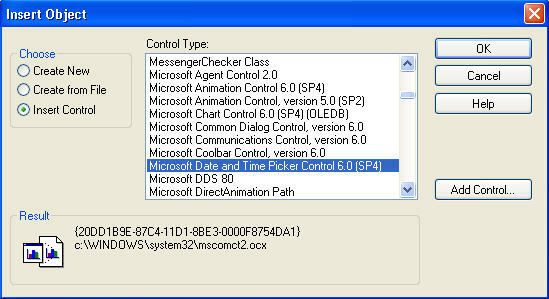 Notice that we are using xSelect logical field of the cursor junk. That is the missing condition I have done last time to make this "taming" work properly. The trick is when we click on a cell, we should turn it's value to .T. so it can show the DTPicker. And when the DTPicker looses focus, we should replace its value back to .F. And that is it! I hope this is clearer and more complete this time. Cheers! 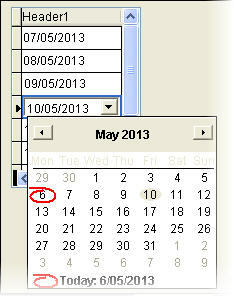 What about if set up column count =2, then i will create another header2, will i will change the caption to Today is, so i want to display there like "Friday", so i meant if the date in the grid just before and open the calendar, i would like the seond column to display the today's date like "Friday" and so on for each row displayed, how to do that ? Hey great! Glad you made it working, I read late, LOL! Thank you for a wonderfully clear and practical implementation instruction for DatePicker control in a VFP Grid! Very much appreciated!! ssDropCalc class in a Grid, How To?